It was my first day off in ages so I had a few household things to sort out including a food shop at Publix. I Skyped for parents for about an hour as I walked around the Magic Kingdom before meeting up with Jack Chandler (who I’ll be traveling with to LA and NYC). I also got 2 Thunder Fastpasses with just my Cast ID after sweet-talking the Fastpass lady into giving me a second Fastpass as Jack was doing a quick four-hour shift at Peco’s. It took a bit of persuasion but she gave me one. I then waited for Jack whilst having lunch at Peco’s and waited for the parade came along - except it didn’t because it was raining, so I got to see the rainy day cavalcade which happens very rarely so it was cool to see that. I would have ticked that off the bucket list had it been on there. The Rainy Day Cavalcade is shown when weather cancels the main 3 o'clock parade. We then rode Big Thunder which has started to grow on me after my initial disappointment of comparing it to Paris - it still is really fun actually. We then saw almost all of the Dream Along with Mickey show and then watched the Move It! Shake It! Celebrate It! Street Party which was fun although it was shortened because of imminent rain. Then I went and played the interactive card game, Sorcerer’s Of the Magic Kingdom. It was actually pretty fun and you can get cards to collect - up to 5 a day and I could see it quickly becoming addictive. Jack was clearly a big fan as he had an entire folder of them! A ride on the Carousel was in order next. Then it was time to start ticking attractions off the bucket list, Tom Sawyer Island was interesting to take a look around and had a few very dark caves but I’m not sure I’d go back. It’s more of a crowd-easer, but it was good to do. We then used our Splash Mountain fastpasses which we’d got earlier on and that was fun. Then I went back to Peco's for the apple juice as it’s great stuff. A large was a bit too big though. Frontierland Mercantile was next as I’d been told during training it was the place to go for pins - so I got a Walt Disney World one and a Magic Kingdom one. I still need to get one for Philharmagic and another for the Carousel. More bucket list rides were ticked off as we did the Tomorrowland Speedway which was surprisingly fun and I’d say better than Paris as you can actually steer these cars, and then rode the teacups which we didn’t even have to wait for. Little Mermaid said it was a 20 minute wait, from experience I knew it’d be less and we were on within 5 minutes. I then walked through the Casey Junior Splash n’ Soak while attempting to stay dry just so I could tick it off the bucket list, and Dumbo followed as it was just a 15 minute wait. We tried for a walk in for Be Our Guest as its popularity has definitely died down but had no luck. We then rode Buzz which was a 5 minute wait, walked onto the Peoplemover and used our Fastpass for Space Mountain, where I sat on the really, really rough back seat. I’ll not profess my love for people mover again as I feel I’ve already done it enough times. 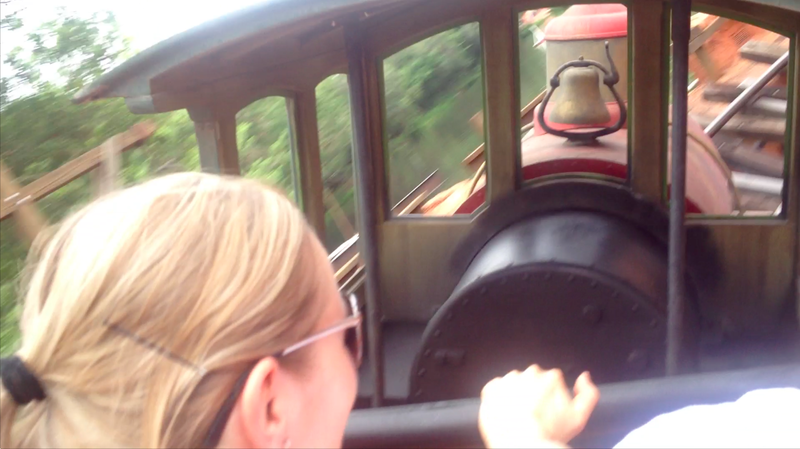 One of the things I really wanted to do was ride Big Thunder Mountain during Wishes. When we got there it was only a 10 minute wait, so why not hit two birds with one stone and complete another bucket list item by doing the ride three times. That’s exactly what we did. In 20 minutes we rode Big Thunder 3 times, including going round and through the queue each time - 2 of those times it was a complete walk on. It was really cool to see the fireworks from such a different angle and they added to the ride, and the ride is definitely cooler at night in general. As we got off the third time, the post-wishes music played and we knew it had been a successful night. We then got our stuff from my locker, got to the bus to Vista and went for dinner at Applebee’s - a shared starter, 9 oz steak with fries and a drink came to $18 including tip which was really reasonable considering the steak was great and only a few dollars more than a quick service meal in a theme park. I got the bus to Chatham and it was the end of a good day - including the parades, shows and cavalcades I did 19 attractions in 7 hours or one every 22 minutes. Considering I went to my locker in that time, walked between attractions, watched 2 shows and did it all at a leisurely pace that’s pretty good! A great day and now I’ve done everything in the park except the Riverboat and the Hall of Presidents - great stuff!